Thank you, Delilah, for having me as your guest today. Isn’t Fall a wonderful time of year? I’m looking forward to cooler weather. To me, the air thrums with excitement due to so many plans and projects. Writing is my passion, but I love the upcoming holidays. THE SURPRISE BRIDES: JAMIE to one person who tells me. We have four brothers aged from twenty-two to thirty-two who need brides. At least, their mother thinks they do. (Yeah, all mothers think that, don’t they?) This mother takes matters into her own hands, though. The four mail-order brides arrive in a blizzard that locks everyone on the ranch for almost a week. The mother convinces the four couples to go through with the wedding. All four stories are filled with conflicts to be overcome. Mine is slightly sensual but not steamy. I believe the other four are the same—the parts I’ve read are. But they are all fun adventures for anyone who enjoys the “fish out of water” of a mail-order bride story. You probably guessed that my latest project is THE SURPRISE BRIDES: JAMIE, one of four books simultaneously released about four brothers in Angel Springs, Colorado. One determined mama, four reluctant brothers, four mail-order brides. 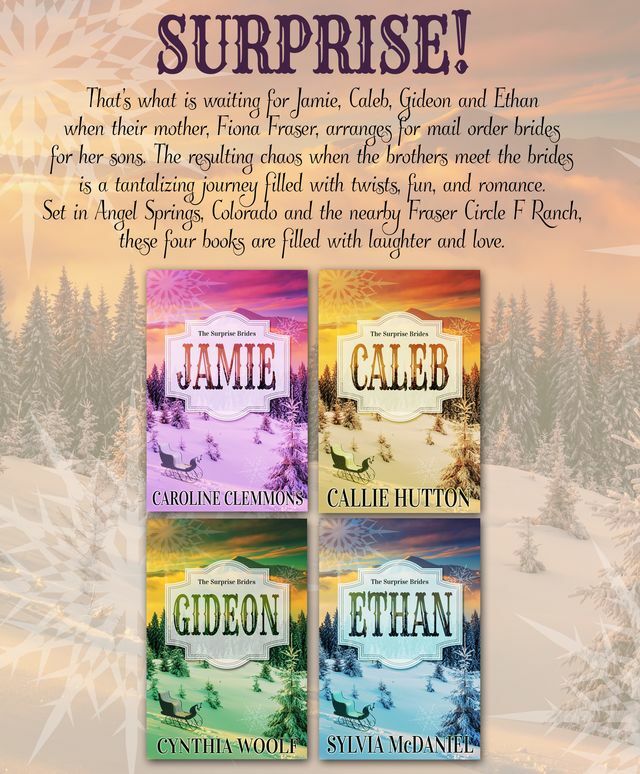 Meet Jamie, Caleb, Gideon and Ethan. Jamie is the eldest brother, a widower with two rowdy young children. These four books are released simultaneously by Cynthia Woolf (Gideon), Callie Hutton (Caleb), Sylvia McDaniel (Ethan), and me (Jamie). Olivia Stewart risks everything to accomplish her dreams. She’s tired of being pitied because she’s been jilted, tired of teaching other people’s children without any of her own. When she signs with a matrimonial agency, a letter from Jamie Fraser sounds perfect. A widower with two young children will give her a head start on the family she’s determined to have. Olivia learns Colorado holds surprises that endanger her goals and even her life. Circle F Rancher Jamie Fraser is shocked to learn his mother has written for a mail-order bride for him. He has two children and no plan to marry again. Ever! His late wife taught him women can’t be trusted. Even his beloved mother isn’t above tricking her sons to achieve her heartfelt ambitions. Now he’s stuck with a wife he didn’t want—a stubborn woman bent on changing his home and his life. Can two strong people at odds achieve happiness? Angel Springs, Colorado is a small town that inspires big dreams. Olivia and Jamie just might find their dreams meld to form a powerful and enduring love. THE SURPRISE BRIDES: JAMIE buy link at Amazon is: http://amzn.com/B015272I3W where it’s available in print and e-book. It’s also available at other online retailers. That night when Olivia and Jamie were in their room, she slowly undressed. All day she’d thought about what she would say. How naïve to think she could trust this man so easily. How stupid she’d been not to ask more questions before surrendering to him. Somehow, she had the sense of having been cheated in the marriage bed. She had no real experience to go on because she had no one in whom she could confide. Judging by the novels she’d read, though, there should have been talk after their coming together. What a maddening answer. She wanted to plant her fist on his handsome chin. Instead, she took a deep breath before speaking and exhaled slowly. His hands stilled. “Ah, well, because Mama’s reputation would also have been damaged, as she pointed out to us boys.” He removed his shirt and hung it on the bedpost. His powerful chest muscles rolled with a shrug. “Wouldn’t mind, now that we’re wed, but I was content with Jake and Cat. Matter of fact, earlier today I mentioned how nice life would be with us brothers taking our kids to visit with their cousins.” He stood and unbuttoned his pants. Again, she froze for a moment. Attractive? He thought she was attractive? When she turned around, he was sitting up in bed with the sheet at his hips. How could she concentrate on the conversation with all those rippling muscles and skin in sight? Caroline and her husband live in the heart of Texas cowboy country with their menagerie of rescued pets. When she’s not indulging her passion for writing, Caroline enjoys family, reading, travel, antiquing, genealogy, and getting together with friends. Find her on her blog, website, Facebook, Twitter, Goodreads, Google+, Shelfari, and Pinterest.